It was in the Spring of 1989 that I prayed for God to open doors for me to go to Medjugorje,(former Yugoslavia) Bosnia(cf: www.medjugorje.org , and www.medjugorje.tv )where the Virgin Mary has been appearing to six seers since her first apparition on June 24, 1981. The opportunity came when I was asked if I wanted to be a delegate fromTimmins,Ontario to attend the ‘VII International Leaders Conference of the Catholic Charismatics’ inRome, beginning October 9, 1989 to October 14, 1989. My plans were to extend the one week trip inRome by another week and visit Medjugorje, to meet Mother Mary. I was joined by nine others from the Rome Conference and we arrived in Medjugorje on October 17th, on Tuesday afternoon. We all stayed at the same house. Tuesday evening, I decided I would rise very early the next morning to go by myself to the Hill of Apparitions. Leaving quietly at 6:25 a.m. Wednesday, October 18th, I was surprisingly accompanied by Father Gaspard Martin ( a priest fromHull, Quebec). As we left the house and began to walk on the dirt road, Father Martin (he had been to Medjugorje two years previous) said to me: “Donald, Medjugorje is not an ordinary place, and also the sun is very different here in Medjugorje.” As he said this to me, there was a most beautiful sunrise in front of us. I stopped suddenly and stared at the sun. The sun was not hard to look at, and it did not hurt my eyes as I stood and stared directly at it. It quickly turned to a pure white colour and began to dance. Afterwards, gushes of crimson red appeared from behind it, top bottom and sides. Afterwards Father Martin and I journeyed up the Hill of Apparitions where we prayed the Rosary together. I never prayed the Rosary so much in all my life, as in the three days I spent in Medjugorje. It was three days spent in intense prayer and praying for others by the laying on of hands. On Friday morning, October 20th, myself and Mila and Nora (two Philipino ladies who accompanied our group fromRome) and another couple, made our way upMountKrisevac. As we climbed the mountain we stopped for prayer and reading of the Word at each of the Stations of the Cross. We arrived at the top around 11 a.m. Each one of us prayed individually, then together afterwards as previously agreed upon. 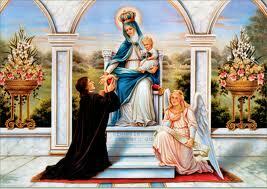 During that time of prayer I consecrated myself to the Immaculate Heart Of Mary. We left Medjugorje at 3 p.m. Friday, October 20th by bus with another group, who informed us that we would be making a visit to the Shrine of Lanciano, in Italy. It was in Lanciano, that the “Eucharistic Miracle of Lanciano” (cf: http://www.therealpresence.org/eucharist/mir/lanciano ) took place 1250 years ago. A Basilian monk who was celebrating Mass and who had a hard time to believe that the bread and wine was the Body and Blood of Jesus Christ, witnessed himself, the bread and wine which he consecrated, turn into real human flesh and blood before his eyes. So here I was on Saturday afternoon, October 21st, in Lanciano, a place I had not planned to visit during my trip toRome. As I was in the church praying, one of the passengers from the bus came to me, interrupted me, and said to me, as he urged me to focus my eyes beyond the altar, up high on the wall of the church, to look up at a large painting of a monstrance with a beautiful, large pure white Host in the centre of it. He then said to me: “See the Host, up high on the wall; it is just like the sun in Medjugorje, which you saw become white and like the Host.” After saying this to me, he left and we never engaged in conversation again afterwards. That was all he said to me. The next day I leftRometo return home toCanada, arriving Sunday evening, and like Mary “pondering all these happenings and revelations in my heart”. I realize, as I terminate my sharing of the pilgrimage to meet Mary, I did indeed meet her in Medjugorje, and Mary true to her role, in turn has pointed and directed me again and again, during my trip, to Jesus in the Eucharist! Thank you Mary, and all praises and honour and glory to Jesus Christ, King of kings and Lord of lords! By: Donald Andre Bruneau, November 25, 1989.